Saints have named an unchanged 19-man squad for Thursday’s Betfred Super League derby with Wigan Warriors at the Totally Wicked Stadium. 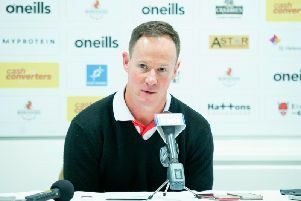 Justin Holbrook, who has opted to select the same side which beat Hull FC 45-0 last Saturday, said: “I think I got here at a good time I arrived just ahead of the Magic Weekend which I felt was a great concept and something we don’t have in Australia. “Now I’m rolling on to a derby match in which there is great rivalry and will be huge for both clubs. 2. Tommy Makinson, 3. Ryan Morgan, 4. Mark Percival, 5. Adam Swift, 6. Theo Fages, 7. Matty Smith, 8. Alex Walmsley, 9. James Roby, 10. Kyle Amor, 12. Jon Wilkin, 13. Louie McCarthy-Scarsbrook, 14. Luke Douglas, 16. Luke Thompson, 17. Tommy Lee, 18. Dominique Peyroux, 19. Greg Richards, 20. Morgan Knowles, 28. Regan Grace, 36. Zeb Taia. 5. Joe Burgess, 6. George Williams, 7. Thomas Leuluai, 8. Frank-Paul Nuuausala, 9. Michael Mcilorum, 11. Joel Tomkins, 12. Liam Farrell, 13. Sean O’Loughlin, 16. Sam Powell, 17. Taulima Tautai, 19. Ryan Sutton, 20. Willie Isa, 21. Lewis Tierney, 23. Nick Gregson, 28. Jack Wells, 32. Liam Forsyth, 35. Liam Marshall, 36. Tom Davies, 37. Callum Field.